It was promoted as a “world-class” label for animal welfare. The “Pigcare” label stamped on local pork products risked breaching the Fair Trading Act and misleading consumers about the animals’ welfare, a Commerce Commission investigation found. 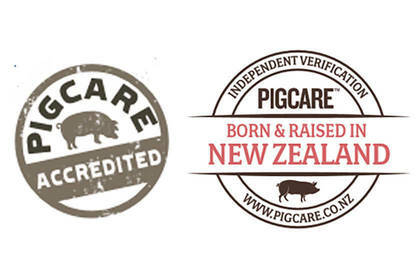 The Pigcare label was launched by NZ Pork in 2010 and promoted as a “world-class” seal of approval of high animal welfare. We criticised the labelling programme at the time for failing to require farmers to do more than meet the minimum standards of the animal welfare code. Six years after the label was launched, the commission’s investigation concluded it may have misled shoppers about the welfare benefits provided to animals at Pigcare-accredited farms. “The Pigcare logo … may give consumers the impression that pork products with these labels are farmed with methods that provide pigs with significantly greater welfare than provided by the minimum legal requirements,” said commission head of investigations Ritchie Hutton in a letter to NZ Pork. Mr Hutton said NZ Pork’s own consumer survey lent weight to the commission’s conclusion. Survey respondents thought the label showed Pigcare-accredited farmers used ethical practices and cared for the welfare of pigs. “This may be inconsistent with the actual farming practices of some pig farms, which nevertheless still qualify to use the Pigcare label,” he wrote. The commission’s investigation of the Pigcare label, which stemmed from complaints from animal rights group SAFE and others, resulted in compliance advice being issued to NZ Pork. Compliance advice is used to caution companies about their Fair Trading Act obligations. Old Pigcare label (left) and new logo (right). In its advice, the commission suggested NZ Pork add qualifying statements to the logo, “mak[ing] clear the limited nature of the Pigcare requirements”. It also suggested improving website information to clearly identify the welfare benefits pigs farmed under Pigcare receive, above those required by the code. NZ Pork chair Ian Carter says it never intended to claim the label presented a welfare benefit beyond that required by the code. Where Pigcare “raises the bar”, he says, is in the additional factors it assesses, such as the standard of buildings and farm maintenance. NZ Pork has recently overhauled the logo. Mr Carter says the revamped logo is designed to distinguish local pork from imported meat, which comprises 58 percent of the market. The logo features a prominent “born and raised in New Zealand” tagline as well as a link to its Pigcare website. Despite the commission’s recommendation to improve the online information available to consumers, the Pigcare site continues to refer to the programme’s “high welfare standards” but doesn’t explain these standards are the same as required by the animal welfare code. Pigcare is one of 3 main logos shoppers can find on local pork products. The SPCA’s Blue Tick and Freedom Farms’ “Independently Audited” logo are the others. A key distinction between the schemes is their approach to controversial farrowing crates. The animal welfare code allows sows to be kept in the crates for up to 5 weeks when they give birth. Pigcare adopts the same rule but both the Freedom Farms and SPCA schemes prohibit their use. Farrowing crates prevent the sow from turning around. They were introduced to reduce the risk of piglets being crushed and improve production. A 2016 review by the government’s National Animal Welfare Advisory Committee concluded the crates should be phased out but considered it couldn’t happen until alternatives were available that maintained production levels. The committee recommended the crates “be kept under review until improved feasible alternatives emerge”. The outcome won the backing of NZ Pork but met with opposition from animal rights groups SAFE and the SPCA, which continue to campaign against the use of farrowing crates. Outdoor stocking density: 20 adult pigs per hectare; piglets stay with sow until weaned at 21 to 28 days and transferred to shelters. Industry participation: seven farms in the South Island supply meat for the Freedom Farms’ brand. Outdoor stocking density: not specified. The animal welfare code states stocking density depends on the site and rates are determined by local councils. Outdoor stocking density: 20 adult pigs per hectare; piglets stay with sow until weaned at 21 days and transferred to shelters. Industry participation: 2 brands have the Blue Tick (Countdown Pork and Kiwi Bacon). In 2016, the Ministry for Primary Industries announced it was commencing a 3-year inspection programme of pigs farms. Between March and July 2016, 32 inspections were carried out on indoor and outdoor farms of various sizes. Information released to Consumer under the Official Information Act identified issues at 7 farms as follows. Issue: Sow with injury to right front leg that could not bear weight and pigs found without access to water. copy of the animal welfare code provided. Issue: Pig with skin disorder; another animal appeared lame. lame animal was to be monitored by farmer. Issue: Farmer may be leaving pigs in farrowing crates a week longer than animal welfare code allows; one sow was suffering from bloat. copy of animal welfare code provided. Issue: Pig experiencing lameness after transfer from soft litter to slat floor. farm staff grinded rougher concrete in older sheds to try to alleviate lameness. Issue: 2 pigs with umbilical hernias. farmer was given advice on euthananising small animals. Issue: Pig with low body-conditioning score. pig was drenched for worms. Issue: Swill fed out in old housing in poor repair; very muddy conditions around all sheds, though pigs considered in good condition. inspector discussed with farmer reducing stock levels.